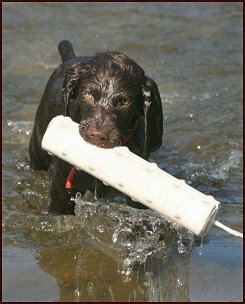 When you buy a puppy from Just Ducky Kennel you are getting a pup who has a head start on his or her training. My goal is to produce healthy smart dogs who excel in the field and are a joy to have in the home. All Just Ducky puppies are born in the house and are handled several times a day. At about 4 weeks they are moved outside and taken out to the yard and pond several times a day. All pups are introduced to birds, water, fields and woods before going to their new homes. When pups are about 6 weeks of age I take the entire litter on walks each day - going straight over obstacles rather than around them - through the woods, over logs, under fallen trees, through streams, and into ponds. 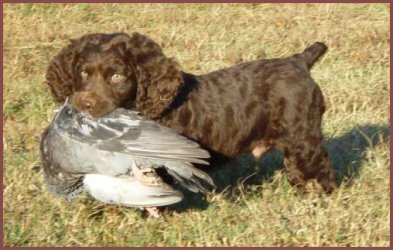 All pups will retrieve a whole pigeon by 10 weeks of age. All pups are acclimated to loud noises and gunfire (from a distance). 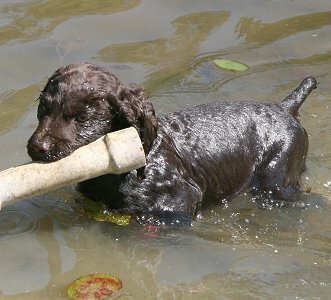 Pups will be swimming and fetching on land and in water (weather permitting) by 10 weeks of age. Pups stay here until they are 11-12 weeks old for a head start on their gun dog training. That way they can be evaluated to match up with the perfect home. Each sire and dam is tested and cleared for hip dysplasia (OFA), eye disorders (CERF), and heart conditions (OFA cardiologist). All puppies are eye CERF'ed at 7 weeks and hearts are double-checked by a practitioner. All Just Ducky pups have an unconditional money-back warrantee. If, for any reason, one of my pups doesn't work out, simply return the pup for a refund. In the same respect, I expect puppy owners to be responsible in the care and future breeding of any dog they buy from Just Ducky Kennel. I ask that no pup be bred until at least 2 years of age and all health clearances have been met. 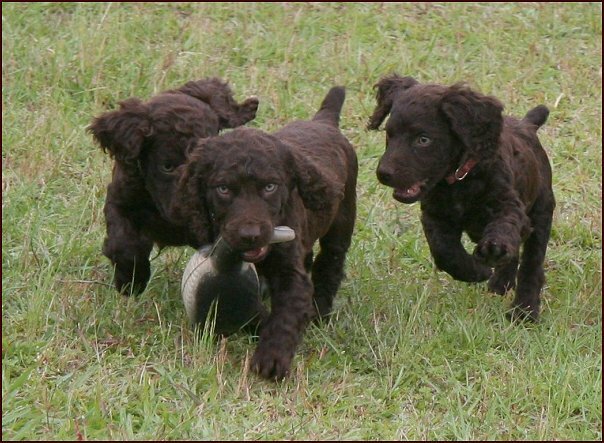 For this reason all Just Ducky puppies are registered with the Boykin Spaniel Society with Limited Privileges (LP). All pups registered with UKC-HRC are under a 2-year co-ownership contract. 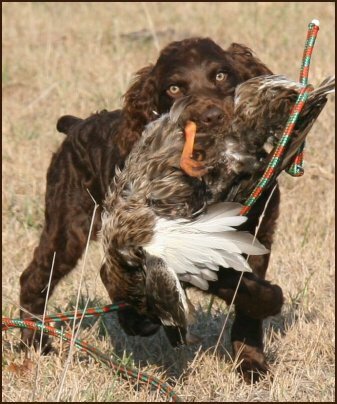 Send an e-mail and describe exactly what you are looking for in a Boykin - what kind of hunting you will be doing, whether the dog will be a house dog, whether you have a fenced-in yard, children (ages), and whether you prefer a male or female pup. When I have puppies available I will contact you to see if you are still in the market for a pup. Hunting/hunt test homes get first preference. Rarely do I sell to pet-only homes unless the pup doesn't show retrieving drive and ambition. New owners are encouraged to send pups back to the Academy for one month session of Puppy Kindergarten at 4-5 months of age. Pups then go home and work with the family. 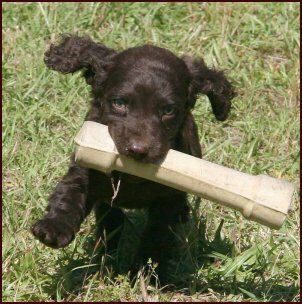 When pup is about 8 months of age he or she may come back to the Academy and gun dog lessons continue. Over 30 years experience training, trialing, hunting and judging dogs. copyright 2000-2009 - Web Designs by P.K.